That took a lot...to leave the needle in...to keep pressing on the plunger...it hurt! Did I hit a vein? It's hard to find a spot on my thigh that doesn't have a vein peeking through. How much is it going to bleed? Ouch. Damn. Maybe I should go back to icing the spot prior to the injection. Icing...I have a can of icing in the fridge...that's what I need right now. 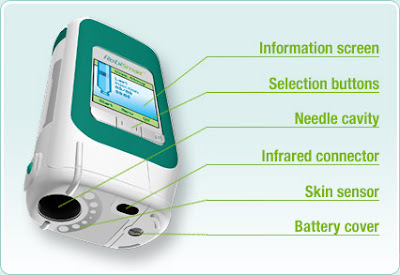 Well I'm glad that I cleared it up - even if using the Rebismart injection device, I can collect Air Miles! I was worried that I was going to be forced to decide between rewards and injection comfort! According to the representative at the Multiple Support Program (the telephone nursing company used by EMD Serono to assist Rebif users), I am the first patient in Manitoba to be using the device. Are you using Rebismart? Let me know! I have completed two weeks of Rebif, and there is something that I need to work on: don't tense up just before the needle breaks through my skin. The injections themselves sting, but I'm not having any site reactions. I'm experiencing some mild P.I.D. days, and definitely over-night aches. Ladyfingers and Dude are visiting! We're having a great visit - lots of games, good food, lazy mornings, watching sports on television, spa day, and hugs! 1. The selections have been made for Em's Slackers Spring fundraising drive! I can't wait to share them with you! And you would have 4 a.m. blues too if you had to get out of bed (in the crisp February morning) to take some ibuprofen for body aches. From the soles of your feet, to the tip of your pinky! By 8:30 a.m. I was ready to get up and head out to aquafit. I thought that the water swirling around my body might feel good - like a warm bath. Gentle movements, simple stretches, and the relaxed feeling that I naturally get in water. Today marks the return of P.I.D Days (Post Injection Day). That did not go as planned...or hoped...or imagined. My first Rebif shot in over 9 months, is one for the books. Jason has a bad habit of beating himself up. Things can happen so fast. I may remain calm, but not necessarily smart. I think that we were too casual. Or I was too casual, and Jason was nervous. That's more like it. I try to be casual and relaxed when it comes to injections. If I'm not anxious, then Jason won't be anxious. I don't anticipate pain or discomfort, as I don't want him to feel as if he is responsible for any pain that I may experience. I thought we had it in the bag. I rolled up my sleeve, found a prime spot in my arm, and reviewed the steps of pinch, poke, release, plunge, remove. When Jason missed the release, the needle popped out...or something like that. The drug was still mostly in the needle. Some dribbled on the floor, and on my arm. If you read the beginning of this post, you know what happened next. Except for this part. I blindly stuck the needle back in my arm and finished the task. I don't care about what happened. I care about Jason's reaction to what happened.